So as you all know, in the next patch we'll be getting new clan tags. So our old ones can still be used of course, but we can definitely add our tags to our normal and clan accounts. That way when we're in game we'll always be recognized as a clan, no matter what account we're on =). According to the Mudinator himself, the tags are 3 characters long, so I figured we should decide on what we'd like our clan tag to be. I'll turn this thread into a poll when we have a few options, but so far here are a two ideas that have been passed around. I know that cMOB and CMOB were both ones that we wanted, but since we only get 3 characters, that's not gunna work =\. Put your ideas down and I'll add them to the list and we can have a clan vote on them =3. either are fine for me. probably mob would work best. Haha I think people would be weirded out by >=3 even though that's brilliant and innovative. Everyone will be using three letters - why not three symbols? But MOB would probably be best. "COO" doesn't do it for me. i feel like MOB is too generic but i can't really offer a better alternative. CKE? TCM? NOM? Nom isn't a bad one lol, I think ">=3" would be very recognizable, but if someone see's "MOB", they'll say "Hey can I be apart of 'MOB'?" Where as with ">=3" they may not even know what it is, let alone what to call us lol. I like Nom too, but I think MOB will be most recognizable....actually I like >=3 the most, but people probably won't know who it is or what it relates to XD. NOM! I vote for NOM. It's so cute and creative! I like it. MOB is a little too boring. I know its recognizeable but blahh its boring. I actually didn't know what NOM was until I came here and if a random person saw NOM, they wouldn't either. They might think it's some kind of dummy clan or something. 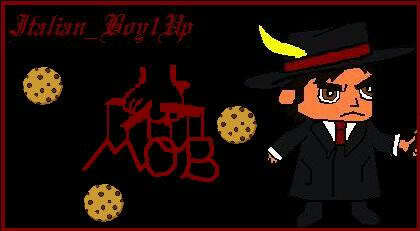 But MOB is official and recognizable. It's already part of our clan accounts anyways so why make things more confusing. Haha no Muffin, we'd first need to make a motion to introduce conference procedures, then write a procedure for approving procedures, then approve the motion for a conference, then organize a Board of Directors, then make a decision. I estimate we'll be done in 5 months. And that's if someone doesn't move to have conference to consult it at a further date o_o lol. While I like "NOM" and ">=3" a lot, It's looking like MOB is the best option, but just to make sure I'm gunna put a poll up to make sure we're on the same page for the most part. sorry but wth is >=3?? i dont get it. Imagine pressing start and seeing the player list full of cookies. C'mon. How does that not make sense?